Your baby has now completed the first significant stage in their development. During the first ten weeks, the basis for everything has been laid. In fact, you actually have a complete mini-person in your belly. Baby of course still needs to continue growing and all those basic systems have to develop further. Baby will continue doing that in the coming weeks. That growth spurt baby started last week also continues. You may notice changes to your body. You get tired more often, which is logical considering your baby has grown at such a rapid pace and is now already (on average) 1.6 inches long and weighs 0.25 ounces! Think about whether you want to attend a prenatal class. You could choose a Lamaze class or prenatal yoga, for example. In some cities, you need to register well in advance. It will still take some time before your belly starts showing that you are pregnant. And yet you will be able to feel that your womb has grown. Lie down on your back and press gently just above the edge of your pelvic bone. Use all your fingertips together. Can you feel the hard edge? A kind of rubber ball? That is your womb! It won’t be long now before you start seeing a little baby bump. 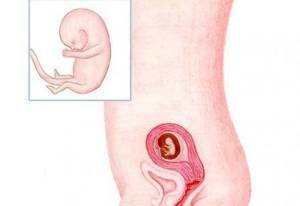 Once the edge of the womb emerges from under the pelvic bone, the womb will no longer be able to hide behind it.